Light and delicious summer salad with grilled prosciutto-wrapped peaches, sweet blueberries, crumbled feta, grilled sourdough and charred corn. Add ears of corn to the grill; they will take the longest to cook ~20 mins. Prepare the prosciutto wrapped peaches: tear the prosciutto into manageable strips and wrap around the peach slices tightly. thread each peach slice onto a skewer. Brush the slices of thick sourdough with olive oil. Make sure your other salad ingredients are prepped and ready. I.e. spinach washed, tomatoes halved, blueberries cleaned, etc. Mix up balsamic vinaigrette: Add olive oil, balsamic vinegar, dijon, honey, salt and pepper to a mason jar and shake vigorously or whisk all the ingredients together in a small bowl. Set aside. Add the wrapped peach skewers to the grill. The prosciutto will start to crisp up. ~6 minutes. Add sourdough bread slices to the grill. Don’t let them burn! Tear into rough 1-2 inch pieces. Assemble the salad: Add the spinach and arugula to a large salad bowl. 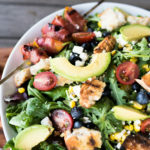 Build it up with corn cut off the cob, halved cherry tomatoes, blueberries, red onion, feta, and diced avocado. Place the prosciutto wrapped peach slices on top with the torn bread and drizzle with balsamic vinaigrette. You could use frozen or canned corn as well. Just warm it up in the microwave or a skillet.